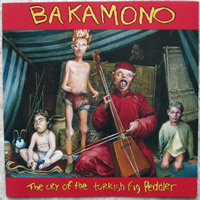 En complément de la Oldies consacrée à Bakamono, The Cry Of The Turkish Fig Peddler est soumis à votre sagacité. C'est le premier album du groupe de San Francisco, le plus représentatif de leur discographie, même si cette dernière reste homogène. Mais au niveau qualité de l'enregistrement et magnificience des compositions, Bakamono avait touché au but sur ce disque, dans le domaine noise-rock retors et extraverti. Sur cette version CD, vous avez quatre titres supplémentaires se trouvant à l'origine sur le 10'' Unko, réalisé la même année en 1994. Pour le reste de l'histoire, c'est par ici. infos : Eiso Kawamoto Jr. - Libra with Scorpio Rising. Sean K. Dorn - Fretless, Feedback. Compost Head - Guitars, Tapes, Vox. D.D. Martin - Drumming. Noise Axes on Dead Zoo by Evan Mack and Johnny Baker. Answering Machine on LTR by Robb Mueller. Front cover painting, "Ehru Player In The Fakirs Bazaar" by Harvey Bennett Stafford. Stencil art by Scott Williams. Black and White Photos by Stacy Stevenson. Collage by Gennifer Yoshimoto. Photo of figs by Ted K. Hood. Recorded and Engineered By Bart Thurber except "Dead Zoo" Recorded and Engineered by Bill Sanke. Drinking hard alcohol and listening to monal music enhances your negative outlook on life. Make sure you feel bitter.